Marguerite’s Christmas isn’t for everyone. The story of a fragile, elderly woman alone on Christmas Eve will leave some wondering if this is appropriate subject matter for children. Others will wonder if its appropriate subject matter for adults, given its juvenile format. But it is a book for me, and anyone who sees storytelling as non-exclusionary. 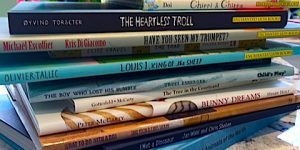 All stories have a place in children’s literature, as long as they are told well, told sensitively and honestly, and in the case of picture books, told with illustrative depth. Marguerite’s Christmas is an extraordinary book. 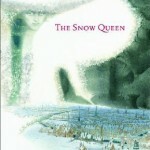 Written by Québecois author India Desjardins and illustrated by Pascal Blanchet (Trois-Rivières), Marguerite’s Christmas is one of the most beautiful books in recent memory, and it also deeply sad, because in Marguerite’s solitude we as readers want to reach out to her, even though her reality – being alone at Christmas – is not particularly unusual. The elderly are not always surrounded by family during the holidays like we see on TV, and some people, perhaps many people, are lonely at Christmas. It’s difficult to know if I am ascribing feelings to Marguerite that she herself does not possess. She claims to be happy cocooning in her home, enjoying comforting rituals like watching her favourite holiday movies and not bothering with the tiresome fuss of Christmas. 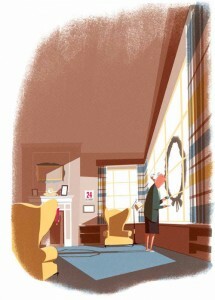 Many of her friends and family have died, and she is no longer interested in making new memories, just revisiting old. She repeatedly reassures her family that she is OK.
And yet, she is frequently startled by routine noises and fears going outside as if suffering from mild agoraphobia. She could probably use some company, but rejects it. Clearly, Marguerite is nearing the end, and at one point even imagines the grim reaper at her door. The scenes that follow give me pause. Is the episode with the car actually happening, or is it part of her ‘passage’ to the other side? 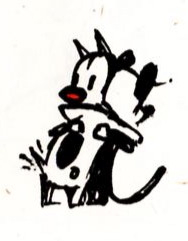 Unlike some adults (or this adult), children will take Marguerite at face-value. The story will not make them uneasy. Instead they will be engaged by Marguerite’s predicament, by her haplessness and vivid imagination (stunningly expressed by the illustrator). Marguerite is a real character. She is endearingly quirky and fastidious. 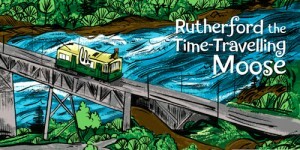 In the most transcendent moment of the book, her kind heart triumphs over her natural reticence when, in spite of her apprehension about venturing outdoors, she helps a stranded family in a broken-down car. It has been a very long time since she has been outside, and the stillness and chill of the winter night releases her fear. 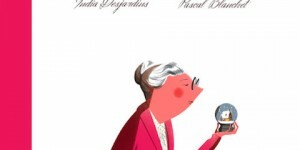 It’s a brave and respectful move by India Desjardins to tell this unvarnished story of an elderly person’s winding-down life, and pitch it at children. For everyone, life is a journey, and each moment has its inherent pleasures and torments. And even when you least expect it, a moment of wonder. The illustrations by Québec illustrator Pascal Blanchet elevate Marguerite’s Christmas into classic holiday fare, pulling out and intensifying the humour and poignancy of Desjardins words. The art is simply stunning, full of quiet, snow-dolloped streets and retro-heavy vignettes that draw from Marguerite’s life, past and present. The exaggerated angles, stylized imagery and flat colours are very much in the manner of Eyvind Earle, one of Disney’s finest background artists. 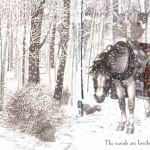 Several years ago, I bought a book of his Christmas card illustrations (800 in total). Blanchet’s winterscapes seem plucked from that magnificent collection of cards Earle created over 60 years ago. Marguerite’s Christmas is perfection from the storytelling and illustration to the candy cane end-papers and placement of the type. It’s one of those books where everything works in exquisite balance, each element enhancing the expression of the other. Yes, it is at times an uneasy, layered read, but it is also deeply touching. I’ll not soon forget Marguerite. I feel like I’ve known her my whole life. 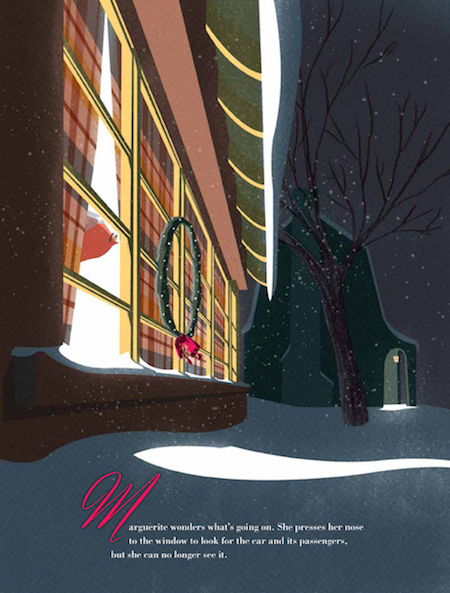 Marguerite’s Christmas by India Desjardins, illustrations by Pascal Blanchet. English edition, published by Enchanted Lion Books, 2015. 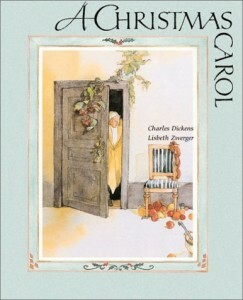 The original French edition of Marguerite’s Christmas, Le Noël de Marguerite (Les Éditions de la Pastèque, 2014) was shortlisted for the 2014 Governor General Literary Award in Canada for both text and illustration. 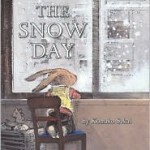 For more CHRISTMAS PICTURE BOOK REVIEWS, click HERE. 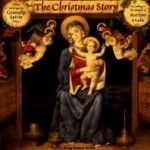 Within that post, is a link to an even longer list of Christmas books! The snow is piled along the driveway, my breath freezes into cartoon bubbles when I exhale, and I’ve heard Santa Baby-that excruciatingly awful song, about a thousand times on the radio. 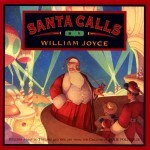 Must be Christmas, and time for an updated list of festively-oriented books for 2012. Building on an original list compiled in 2010, I am pleased to add a couple of new publications to the scroll of Xmas excellence, and a few from years past. As I said in 2010, anyone who collects illustrated picture books knows that Christmas is when artists come out to play~when the pencils are the pointiest, the colours the juiciest, and storytelling the most luminescent. Perhaps it’s the sparkling snow, or the spirited beverages. Maybe it’s the fruitcake. Whatever the reason, beautiful books abound. And now…one final Christmas review~a lively and colourful book from 1962~Kangaroo For Christmas, by James Flora. I was beginning to despair that nothing would jump out at me this December, but not only does the book jump…it leaps off the shelves, across five decades and 32 snow-filled pages. The only thing better than a really cool Christmas picture book is a really cool retro-Christmas picture book, with fantastic sixties-style illustrations, a dad who smokes a pipe, and a kid who says, ‘oh my‘ and ‘we are dreadfully sorry‘. Thanks to Enchanted Lion Books of New York, Kangaroo For Christmas has been spirited out of Mad Men playrooms and digitally restored just in time for Christmas 2011. 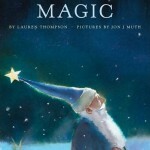 As anyone who collects illustrated picture books knows, Christmas is when artists come out to play. Maybe it’s the sparkling snow, or the um…spirited atmosphere that prevails this time of year. Maybe it’s the fruitcake. Whatever the reason, beautiful books abound, with more published every year. There are also shelves and shelves of dreck the baby Jesus Himself would toss out of the cradle in disgust, but for the most part, something about the festive season brings out the pointiest pencils, the juiciest colours, and the most luminscent storytelling of the publishing year. I always add one or two books to my collection every season, and though I’ve acquired a large number of books, it’s far fewer than I’d like, and less comprehensive than perhaps it should, or could be. Some day I’ll take a serious dive into antiquarian book collecting, but until Santa increases my credit limit, I am compelled to stick with the contemporary and the affordable. Being rather slow and prone to indolence, it would be impossible to write an ‘appreciation’ of every Christmas book in my collection. Nevertheless, these authors and illustrators are appreciated, and so…for your festive pleasure, and my own (slightly) obsessive compulsive satisfaction, I’ve listed my entire seasonal accumulation thus far, in no particular order, within a few loosely fashioned categories. 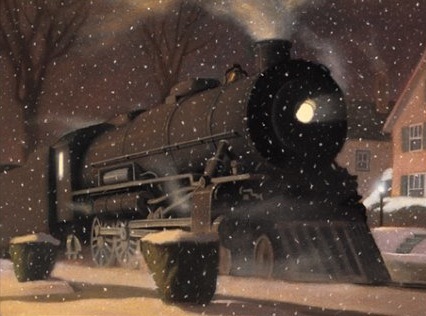 The Polar Express by Chris Van Allsburg (Houghton Mifflin, 1985) Nothing comes even close to the beauty of this book. 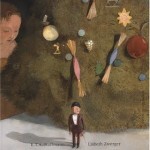 It is quite possibly my favourite picture book of all time. A steam train on its way to the North Pole rumbles through a neighbourhood on Christmas Eve, picking up children, and one particular young boy. Much simpler (and less sappy) than the movie, and far more stirring. 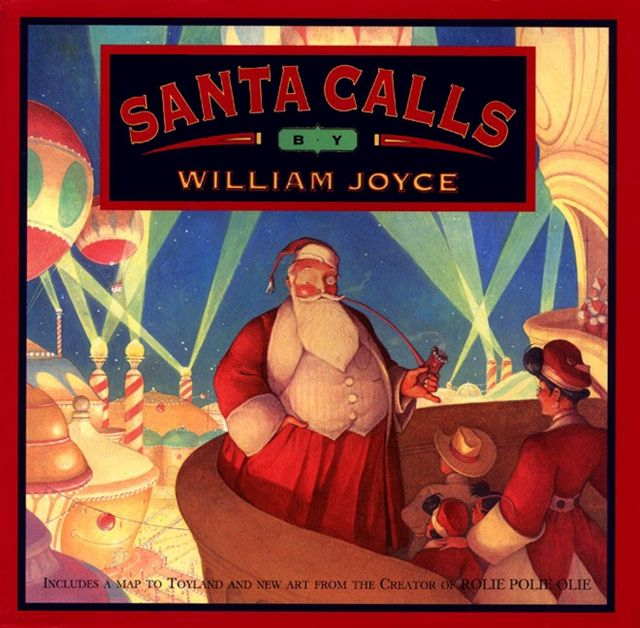 Santa Calls by William Joyce (HarperCollins, 1993) A swashbuckling, cinematic Christmas fable, painted in Joyce’s fantastically unique style. A boy, his sister, and his best friend take a rollicking trip to the North Pole in the Yuletide Flier, which looks like a kayak with headlights. It’s wild, touching, and beautiful ride. 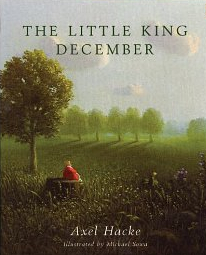 Little King December by Axel Hacke, illustrations by Michael Sowa (Bloomsbury, 2002.) Not really a Christmas story per se, but it does involve a pot-bellied man in a red velvet coat. 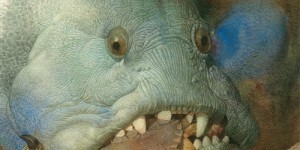 It is unapologically whimsical, and the wonderfully strange artwork by German illustrator Michael Sowa is superb. The Gift of Nothing by Patrick McDonnell (Little, Brown, 2005) This book has become a classic in recent years. All the charm, all the sweetness of McDonnell’s best work. 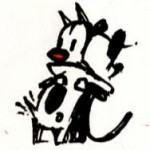 Mooch (the cat) wants to give his beloved friend Earl (the dog) a Christmas gift, but what do you give someone who has everything? Nothing! Nothing…and everything. 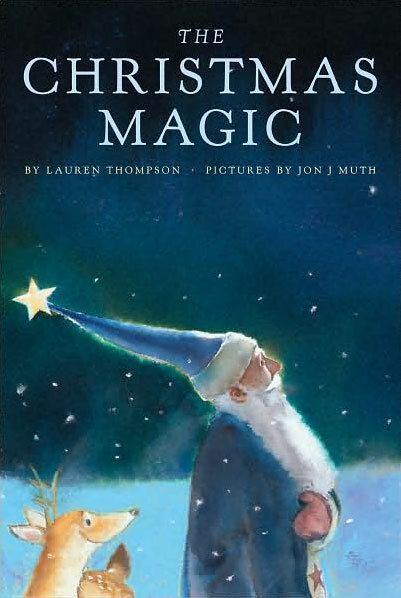 The Christmas Magic by Lauren Thompson, illustrations by Jon Muth (Scholastic, 2009) Santa Claus, re-imagined in blue, with a pointy hat and a pet reindeer by his side, quietly preparing for his annual giftathon. 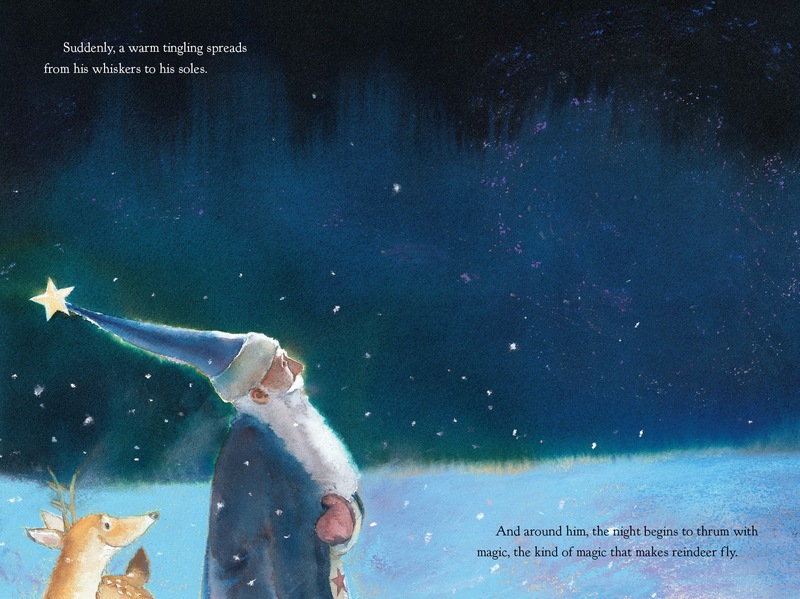 And the north pole at night, painted in the deepest sapphire hues with flecks of sparkling snow…oh my. It’s magic. 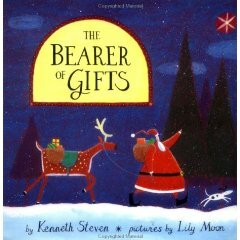 The Bearer of Gifts by Kenneth Steven, illustrations by Lily Moon (Key Porter Books, 1998) I bought this book for the blue and red snowflakes, which are unusual and very striking. A woodcarver in Lapland follows a star all the way to Bethlehem. He ‘presents’ a wooden star to the baby Jesus, and the light emanating from the cradle turns his clothes from blue to red. Returning home to Lapland, the woodcarver starts the tradition of giving gifts at Christmas. Who knew Santa was a Laplander? I thought Coca-Cola invented him. Bear’s First Christmas by Robert Kinerk, illustrations by Jim LaMarche (Simon & Schuster, 2007) Awesome cover, and the lovely acrylic and coloured pencil illustrations within are bursting with warmth, in spite of the wintry landscape. A bear awakens from hibernation and is drawn to the sound of singing coming from somewhere in the forest. 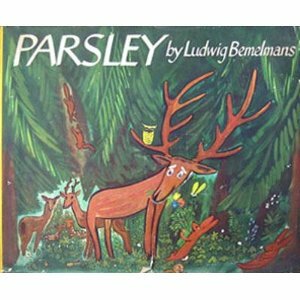 Along the way, he helps a shivering crow, a moose and some pheasants, and they too join him on his quest to find the source of the music. 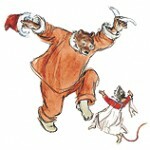 Merry Christmas, Ernest and Celestine by Gabrielle Vincent (Mulberry Books, 1987) So deeply and wonderfully sweet. 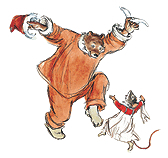 Celestine is a little mouse and Ernest is a big bear. They have no money but manage to put together a splendid party for their friends. It’s completely loveable, this story. Mr Willowby’s Christmas Tree by Robert Barry (originally published in 1963, republished in 2000 by Doubleday.) So charming. Mr Willowby’s tree is too tall, so he gets his butler to cut off the top. The butler gives the top to the maid, who also trims the tree, giving the extra to the gardener and so on until the tiniest tip of the tree ends up with a family of mice. It’s fun to read, and has been restored in full colour. Love it. I’ll Be Home For Christmas by Holly Hobbie (Little, Brown, 2001) Yeah, I know, but this is not your bonnet-wearing, unbelievably cloying 1970’s ragamuffin. The illustrations are superb, especially the scenes of Toot (a pig) struggling through a snowstorm on his way back to see his BFF Puddle (also a pig) on Christmas Eve. It’s sweet, but not sicky sweet, and it is gorgeous. One of those books where the cover does not do justice to the splendour within. And not a bonnet in sight. Just pigs and snow. The Christmas Story~King James Bible, illustrations by Gennady Spirin (Henry Holt, 1998.) This is Christ’s favourite version of His story. He told me. 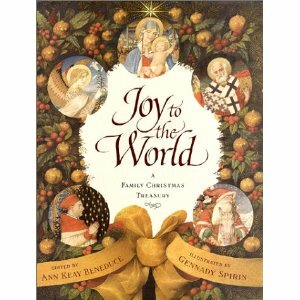 Joy to the World by Gennady Spirin (Atheneum, 2000) A treasury of songs, stories and poetry, but the real treasure is Gennady Spirin. His gold-flecked illustrations have a gorgeous medieval vibe, which is really rather fitting considering the subject matter. Spirin’s paintings are so detailed and gallery-perfect, not just in Joy to the World and The Christmas Story but in all of his books, this Russian seems born of another era. Through the Animals’ Eyes: The Story of the First Christmas~Christopher Wormell (Running Press, 2006) Awesome woodcuts, I mean, lino-cut illustrations.Assorted shepherds and lots of beasts, in beautiful, bold outline. 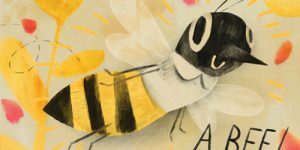 The honeybees are especially lovely. A Small Miracle by Peter Collington (Knopf, 1997) A total tearjerker. In 96 wordless panels, Collington tells the story of a poor old woman who reassembles a creche in her church after it’s been vandalized. Without food and exhausted from her labours, she collapses in the snow, and is then saved by all the little figures from the nativity scene. A Christmas Carol-Charles Dickens, illustrations by Lisbeth Zwerger (North-South Books, 2001) The next best thing to the Alistair Sim movie, the lovely and slightly macabre illustrations by the spectacularly talented Zwerger will knock the scrooge right out of you. A Child’s Christmas in Wales by Dylan Thomas, illustrations by Trina Schart Hyman (Holiday House,1985) “There are always uncles at Christmas.” And hardboileds, toffee, fudge, allsorts, crunches, cracknels, humbugs, glaciers, marzipan, and of course, Dylan Thomas’s gorgeous prose, and Trina Schart Hyman’s snow-flecked illustrations. A classic. 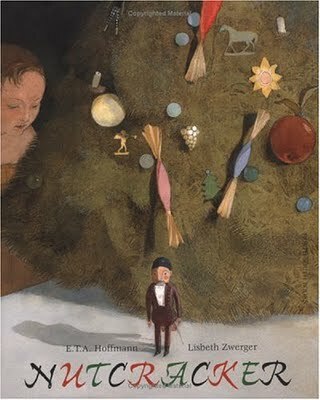 The Nutcracker-ETA Hoffman, illustrations by Lisbeth Zwerger (North-South Books, 2003) Having sat through the ballet several times, I can truthfully and emphatically state, this book is better. Stunning, in fact. 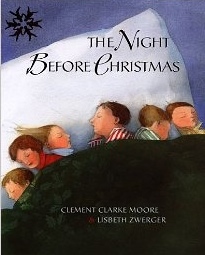 The Night Before Christmas-Clement Moore, illustrations by Lisbeth Zwerger (Penguin, 2005) Sweetly and beautifully reimagined. The old elf has never looked so jolly. The Twelve Days of Christmas by Louise Brierley (Walker Books, 1986) Brierley’s elongated, stylized illustrations are perfect for this old English carol. The eight-maids-a-milking are particularly fine, especially the cows being a-milked. 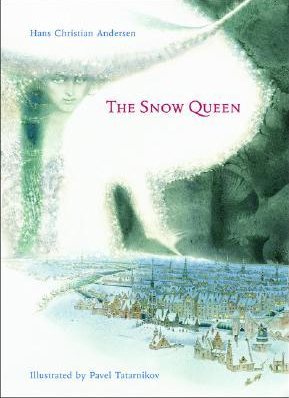 The Snow Queen by Hans Christian Andersen, illustrations by Pavel Tatarnikov (Purple Bear Books, 2006) Many lovely versions of this story of a cold-hearted bi…queen exist, but this edition by a relatively unknown Russian illustrator is absolutely breathtaking. And strange. The giant crow painting is a standout. The Steadfast Tin Soldier by Hans Christian Andersen, illustrations by Fred Marcellino (HarperCollins, 1992) I just adore this doomed romance between a tin soldier and a paper doll ballerina. The bittersweet ending makes me tear up every time. Marcellino’s coloured pencil illustrations have a kind of soft inner glow, and he is THE master of mice faces. And cat faces. And all faces. It’s the eyeballs. 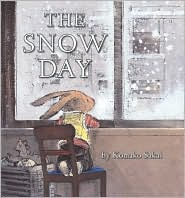 The Snow Day-Komako Sakai (Arthur A. Levine, 2009) A bored little apartment dwelling bunny has to stay inside until it stops snowing. Unusual paint application (dry and wet brush on a black ground) creates illustrations resembling chalk drawings on a blackboard. Beautiful, especially the scenes later in the evening, when the bunny is allowed to frolic outdoors with his mum. 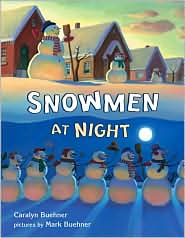 Snowmen at Night by Caralyn Buehner, illustrations by Mark Buehner (Dial Books, 2002.) 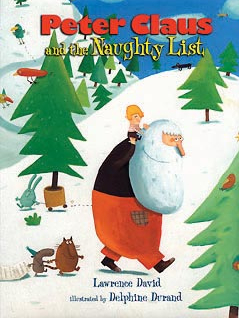 There is a followup to this book, Snowmen at Christmas, published in 2004, which might be more apropos to this list, but I remain steadfast in my devotion to the original. It’s got one of my all-time favourite illustrations of a couple of snowmen hurling themselves down a hill in a state of complete joy and abandon. All snowmen, apparently, once relieved of their stationary daytime duties, party hard at night. Who knew? 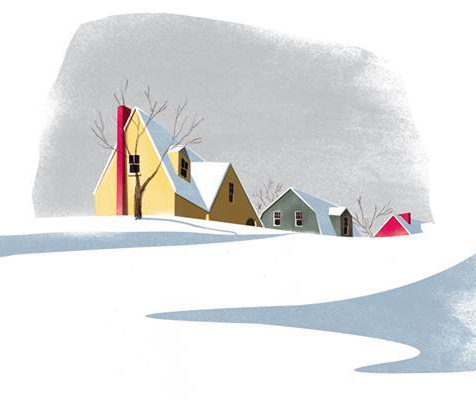 Buehner’s paintings are mostly wintry blues and whites, and it’s damn near perfect in every way. 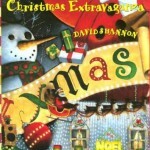 Snowmen at Christmas is also fabulous, but Snowmen at Night is fabulouser. 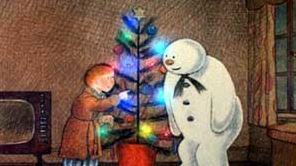 The Snowman by Raymond Briggs (Hamish Hamilton/Puffin, 1978/anniversary edition, 1998) Gobsmackingly gorgeous. 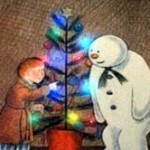 This whimsical, wordless classic is Raymond Briggs best book (sorry Fungus.) Love the illustration of the boy and the snowman flying over Russia in a snowstorm. 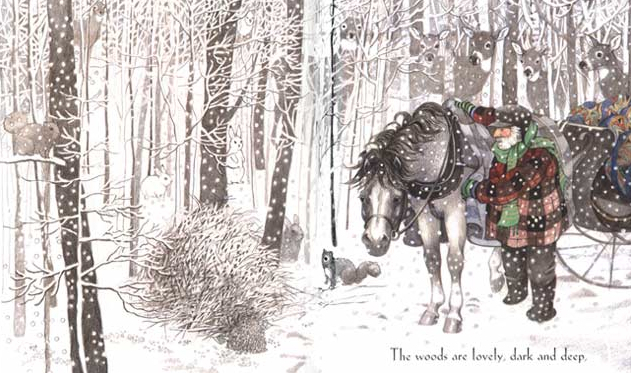 Stopping By Woods on a Snowy Evening by Robert Frost, illustrations by Susan Jeffers (Dutton, 2001) Coloured pencil splendour. Mostly black and white with pops of colour. A perfect book by the perfectly named Robert Frost. Waiting For Winter-Sebastian Meschenmoser (Kane Miller, 2009) This book is wonderful, and already reviewed in this blog. A combination of pencil and watercolour illlustrations tell the story of forest animals waiting for the first snowflake. May I suggest Edmonton? We have many. 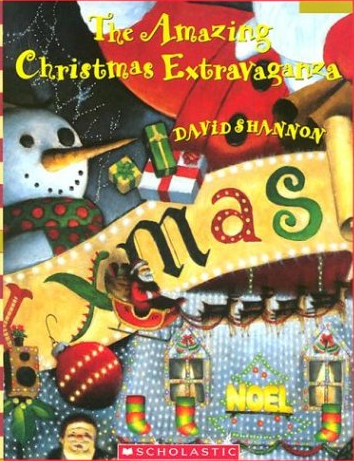 The Amazing Christmas Extravaganza by David Shannon (Blue Sky/Scholastic, 1995) Hilarious. 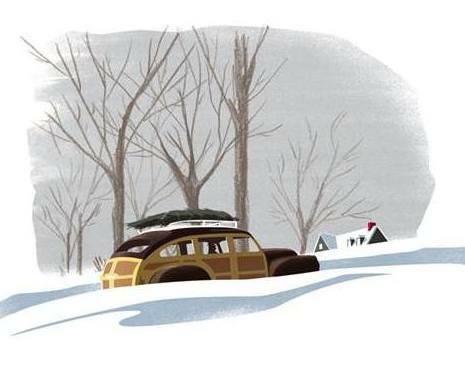 It’s like Christmas Vacation in picture book form, except Clark Griswold has to answer to his neighbours. Sadly, there is no Cousin Eddy, but there are plenty of gorgeous paintings and a lot of laughs. 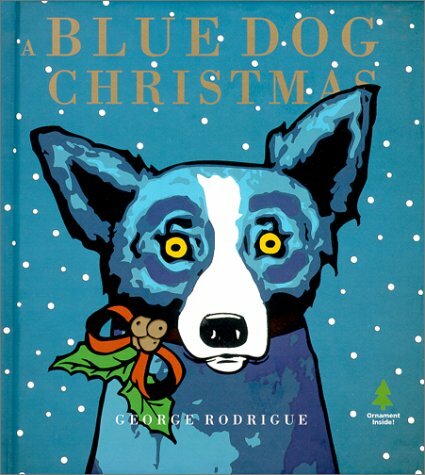 Blue Dog Christmas by George Rodrigue (Stewart, Tabori & Chang, 2000) Page after page of blue dogs, by the artist who made blue dogs famous! 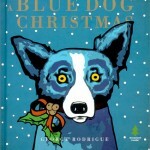 Think of Rodrigue’s blue dog motif as a kind of Monet haystack, but weirder. And bluer. 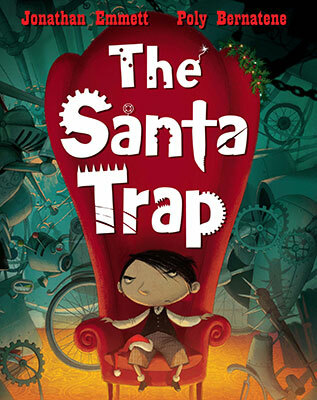 The Santa Trap by Jonathan Emmett, illustrations by Poly Bernatene (Macmillan UK, 2009) Great brat story. Little Bradley Bartleby is an entitled rich kid who sets an elaborate trap for Santa so that he get all of the presents, not just the socks. 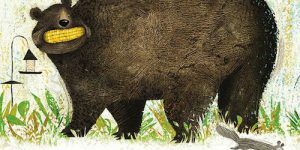 The illustrations have a graphic novel/Shaun Tan feel, with inventive angles, vivid colour, and a lot of hilarious details. It is one of the gems of 2009, regardless of genre. 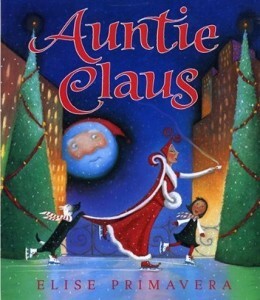 Auntie Claus by Elsie Primavera (Harcourt Brace & Co, 1999) Glorious colour, extravagant storytelling, set in New York and the North Pole. A spoiled girl named Sophie discovers that her ‘mysterioso’ great aunt is actually Santa’s sister. (C’mon Sophie…your last name is Kringle!) Turns out, Sophie’s little brother is on Santa’s naughty list. A lesson will be learned, yes, but along the way to Sophie’s enlightenment, the eyes will be delighted. 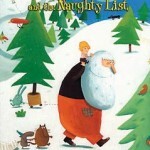 Peter Claus & the Naughty List by Lawrence David, illustrations by Delphine Durand (Doubleday, 2001) You know Peter Claus, Santa’s kid? Well, he feels sorry for all the kids on his dad’s naughty list and tries to persuade the old man to give them a second chance. Hilarious. 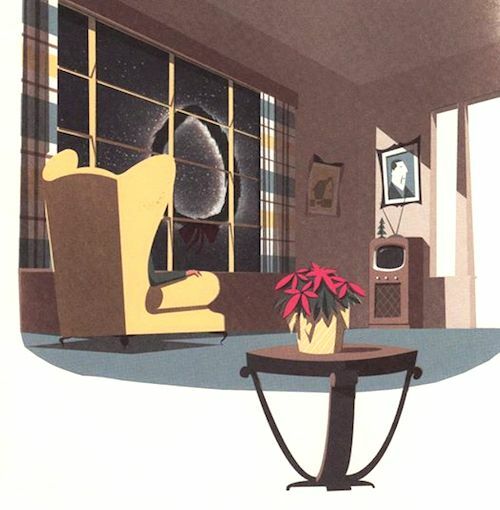 Love, love, love Durand’s whacked illustrations. Fred Marcellino may be the king of eyeballs, but Durand is the queen of noses. 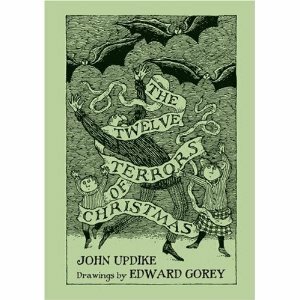 First published in 1993, The Twelve Terrors of Christmas (Pomegranate) is a demented little confection from the pen of Mr John Updike and Mr Edward Gorey, two gentlemen not known for seasonal joviality, or really, joviality of any kind. The book is a scream. I especially enjoyed #12:”The Dark~Oh, how early it comes now! How creepy and green in the gills everyone looks, scrabbling along in drab winter wraps by the phosphorous light of department-store windows full of Styrofoam snow, mock-ups of a factitious 1890, and beige mannequins posed with false jauntiness in plaid bathrobes. Is this Hell, or just an upturn in consumer confidence?” The accompanying art by Gorey is suitably bleak. 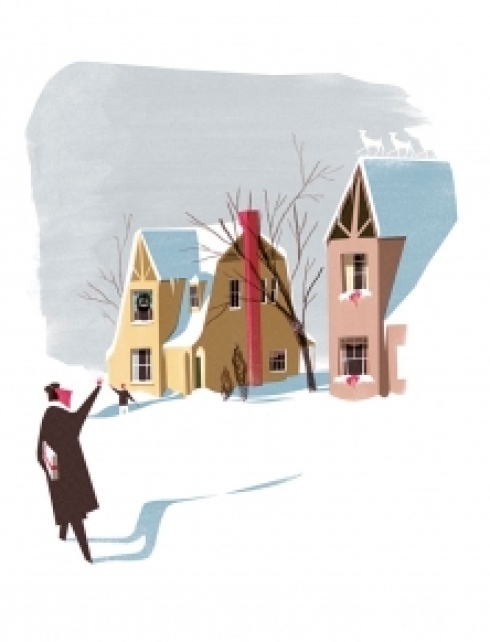 And while you’re stewing in this sour glögg, why not pick up David Sedaris’ Holidays on Ice? Both books will leave you in festively decorated stitches. 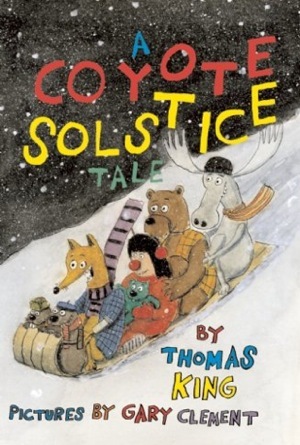 Coyote Solstice by Thomas King, illustrations by Gary Clement (Groundwood Books, 2009) Just found this one, and it’s by one of my all-time favourite authors! Coyote is about to hold a party for all his friends when a little girl in reindeer antlers shows up at his house. She introduces Coyote to the pleasures and perils of The Mall at Christmas time. A message about reverence for the things that really matter, delivered with King’s usual sublime wit and Clement’s hilarious illustrations. 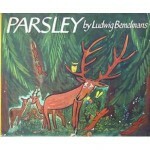 A book I wish I had?~Parsley by Ludwig Bemelmans. Thanks to the Curious Pages blog for this retro suggestion. 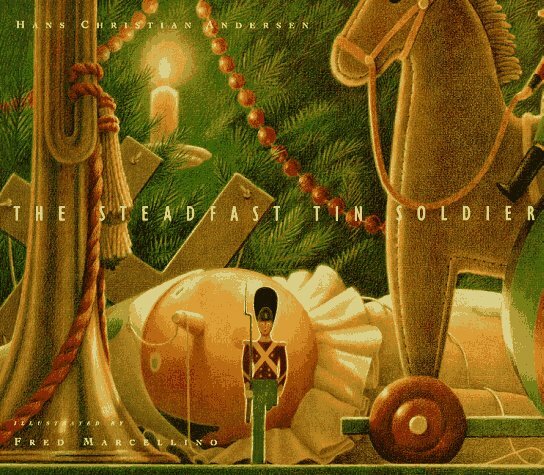 Oh, and lastly~Honorable Mention to Artists’ Christmas Cards, compiled by Steven Heller (Simon & Schuster, 1981) This collection of Christmas cards from illustrators has been an endless source of inspiration for me, and it shows. The book is hanging together by a single binding thread and a piece of tape. I believe it’s long out of print but it’s definitely worth a browse if you can get your hands on a copy.